Tickets are now available for the annual Side by Side Dinner & Draw. This year’s grand prize is a 2019 Honda SXS500 Side by Side. Tickets are $100.00 each or 3/$200.00. 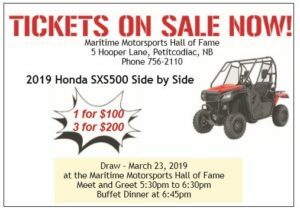 The draw will be made at a dinner to be held at the Maritime Motorsports Hall of Fame on March 23. Tickets for the side by side include the dinner.